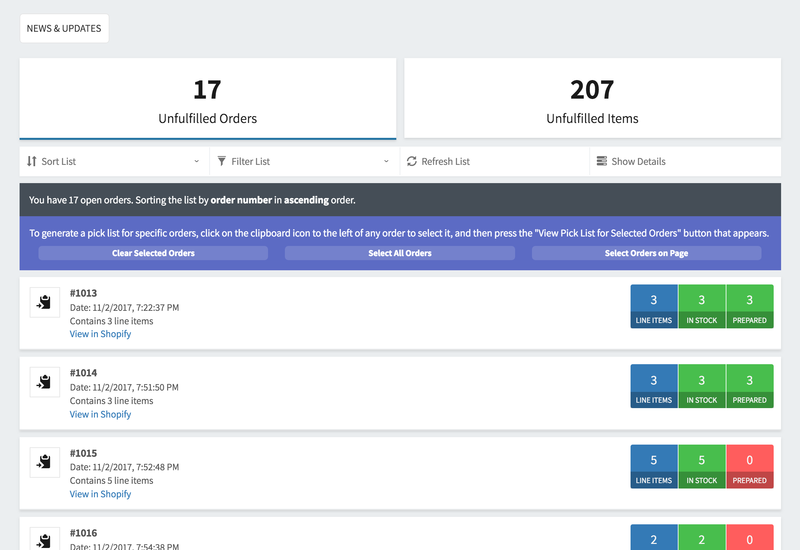 The order view in Logistician 55 groups your unfulfilled line items together with their associated orders, allowing you to quickly and easily see which items are needed to fulfill a specific order, whether or not they are in stock, and if the order has been prepared for fulfillment. The order view can also be used to assist in preparing and fulfilling individual orders. Only unfulfilled items are displayed for the orders on this list, and it is possible that there may be canceled or already-fulfilled items that are part of an order, but not on the list. The badges will change color depending on how many items are in stock or prepared. When there are some items in stock, but the in-stock quantity is less than the quantity needed, the "in stock" badge will be orange, even though it lists "0" line items are in stock. This lets you know that there are at least some items available. This will take you to the item list, but with a filter applied for the selected order(s). The pick list can be printed and sorted, and additional filters can be applied. Clicking or tapping an order will display a list of the unfulfilled line items associated with it, along with the needed, in-stock, and prepared quantities. The quantities shown are per order, and not overall. This means that if you have a 20 items in your inventory, but an order only needs 5, we will only show 5 "in stock". The same methodology applies to the needed and prepared quantities. By default, the list of orders will be sorted by their order number in ascending order (lowest order number shown first); however, it can be re-sorted if needed by using the controls in the menu. Note that when sorting by line item count, our system will go by the number of line items in the order, and not the quantities of those line items. It is possible to select multiple values from a given filter category to expand your results. For example, you can filter for multiple order dates or states of preparation. You may also "stack" filters to narrow your results even further. 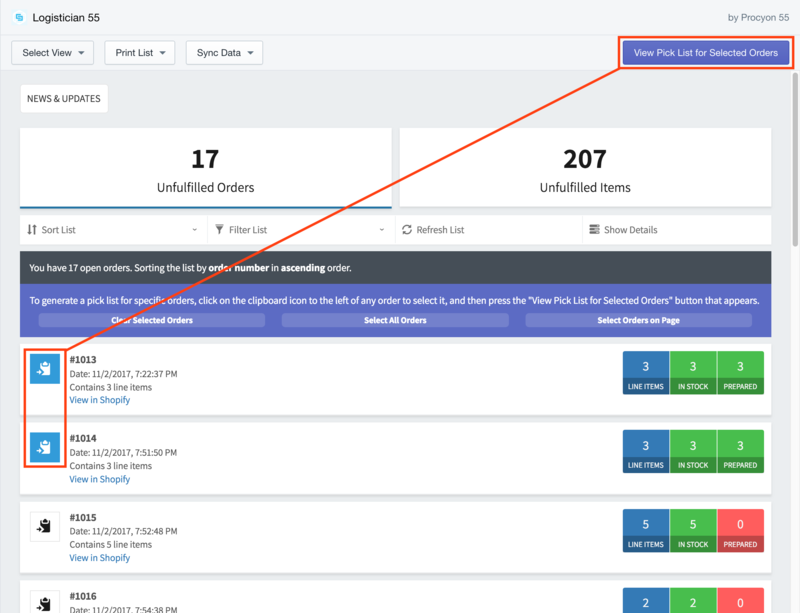 For example, when searching for orders placed within a certain timeframe, you can also filter by preparation state to show only those orders that have had all items prepared for fulfillment. If your store utilizes a "local delivery" app, there is a chance that you will be also able to sort and filter by the delivery and/or pickup dates, depending on the app being used. If you are using a local delivery/pickup app and do not see these options, drop us a line and we will see if we can add compatibility for your setup.